Q. Do you have information on Shelby racing? ​In 1960, Carroll Shelby retired from auto racing and turned his attention to designing and building high-performance automobiles. While the vehicles are re-engineered and adapted from models produced by other manufacturers, they are considered some of the most successful performance cars ever made. Below is a bibliography of material in our holdings for reference use on Shelby Racing. If you have any questions about the material please let us know. Photographs, slides, negatives, documents, programs and published material covering 60 years of automobile racing. Collection comprised of 17 matted and mounted color photographic prints. These untitled, undated images are dye-color transfer photographs of contemporary racing automobiles, race car drivers, racing crews, racing fans, and arenas. All document the 1967 racing season, a high profile motorsports year for the Ford Motor Company. 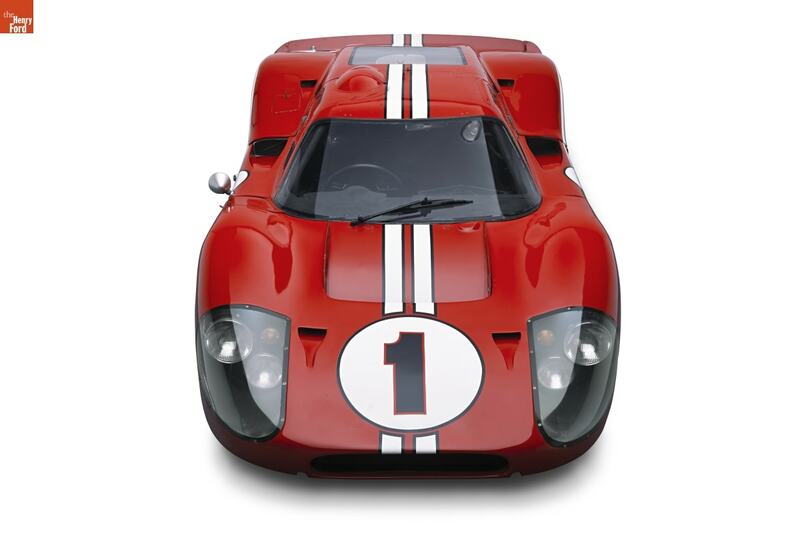 Included are images of the Ford GT40 Mark IV (currently owned by The Henry Ford), the Ford Fairlane 500, the Shelby Mustang GT 500, and the Ghia Mustang concept car. The Dan Rubin automotive photographs collection contains photographic prints, negatives, and slides documenting automobiles and automobile racing, primarily from 1952 to 1967. Peter Bryant papers. Included in the collection are project information relating to buses, electric cars and bicycles, a catering truck, and wind and solar generators. Also included is information relating to Peter Bryant's racing interests including CanAm and Shelby racing vehicles. The oversize engineering drawings include drawings relating to Bryant's specially designed racing car, the Shadow as well as the Shelby Series 1 car. Also included here are drawings for a heavy duty truck, a Continental bus and a special GM Mid Trans Bus. The Don "Sully" Sullivan papers come a former Ford Motor Company engineer, and contain approx. 47 cubic ft. of engineering drawings, notes, and internal documents covering primarily a period from the 1950s into the 1980s. The material is spread across 48 boxes. There are also a number of rolled drawings, four audio and two video reminiscences with Mr. Sullivan about his life and experiences with Henry Ford as well as his later extensive time with Ford Racing. The Automotive Product Literature collection is an intentionally assembled collection of sales, promotional and informational material published by automotive manufacturers and used primarily by automotive dealers or sales agents to market and sell automobiles. The collection includes sales brochures, press kits, press releases, service bulletins, photographs, comparative literature, color and trim books and color chips, salesman's manuals, owner's manuals and reference books for over 1000 past and present automobile manufacturers worldwide. The Phil Harms Collection documents the history of open wheel automobile racing in the United States through still and moving images, data and statistics, event programs, publications, periodicals, and news clippings.